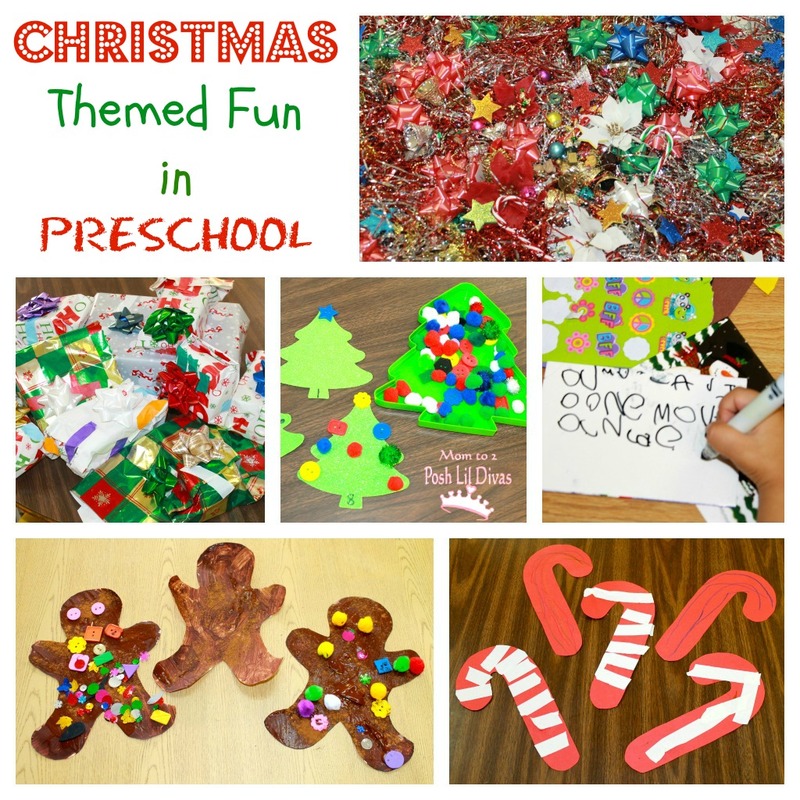 Before the holidays have come and gone I wanted to share a few of the fun activities I have been enjoying with my preschool class. I added some large paper candy cane shapes to my writing table one morning with the following supplies: scissors, white tape ( my kiddos LOVE using our ready supply of colored tape to cut, tear & create) and crayons. 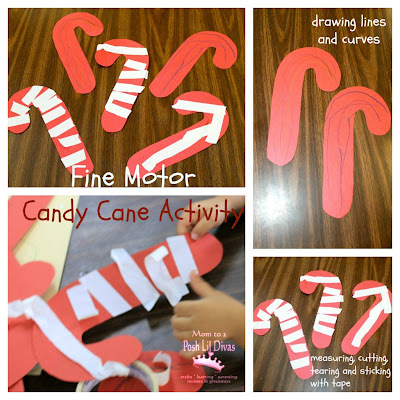 The children were free to decorate their candy canes however they liked. Some decided to use crayons to add colorful stripes and lines. While others took to measuring, cutting, tearing and sticking the tape on as stripes. All were happily engaged in some easy fine motor and pre-writing practice (cutting, tearing, grasping and making lines) and went home with lovely decorations to hang up for the holidays. I found the cutest glitter tree cut-outs at our local dollar store (it's my favorite go to shop for my preschool class) to use for our math area. How? I wrote the numbers 1 thru 10 on the tree bases and added the correct number of corresponding dots on each tree. 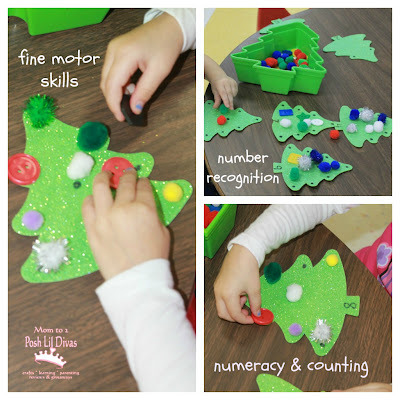 Add in some fun colored and textured pom pom balls, some buttons and maybe even some sequins or beads and let the children decorate the trees as they work on their number recognition and counting skills. 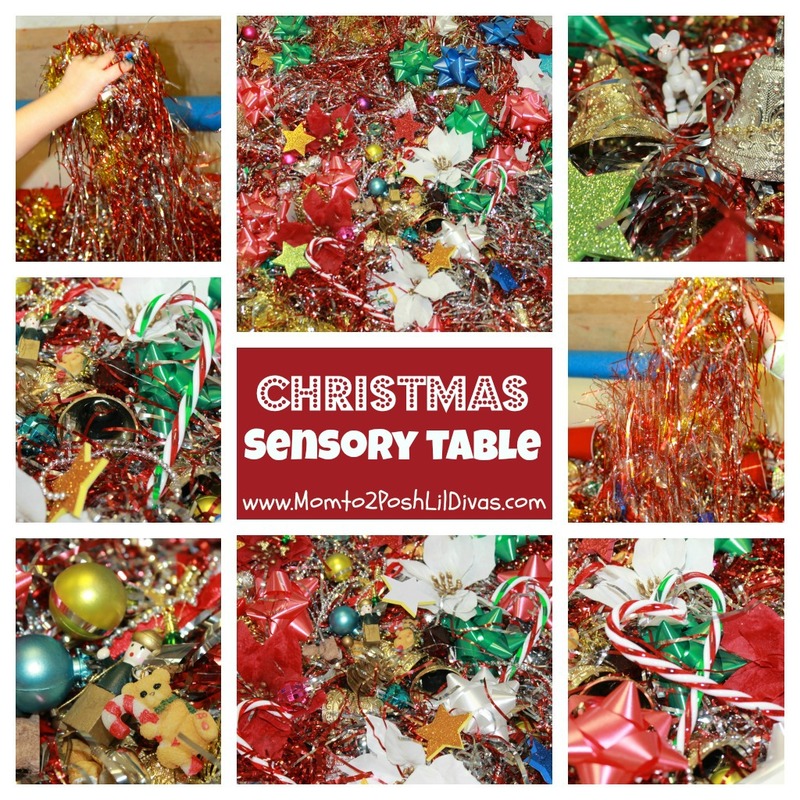 Our Christmas themed sensory table was a huge hit this month. I cut up tinsel and garland and used that as my base. Then, I added lots and lots of Christmas themed treasures for the children to find - small plastic ball ornaments, jingle bells, christmas bells, plastic candy canes, bows, jewels, large glittery star stickers, plastic poinsettias, cut-up bead garland, bells and small wooden figurine ornaments. 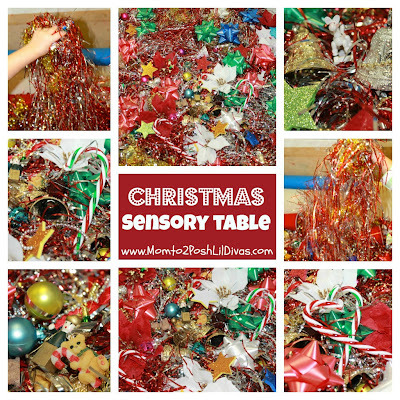 I also added plastic cups, scoops, shovels and spoons but they preferred to use their hands mostly to sift through the tinsel. The fun part was that the more they sifted through the more things got buried so it was a true treasure hunt each and every time. We have been reading all the different versions on the Gingerbread Man story - The Gingerbread Boy, Gingerbread Girl, Gingerbread Cowboy, Gingerbread Baby and Gingerbread Friends. 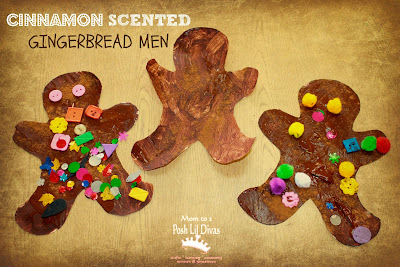 My class really enjoyed making our simple Cinnamon Scented Gingerbread Men. I used brown tempra paint and mixed in glue and cinnamon powder right into the paint. When the children finished painting their Gingerbread Man they sprinkled some extra cinnamon on top and then decorated them with pom pons, buttons and sequins. The best part was that no extra glue was necessary for our decorating - it was already in the paint. The children were so excited to take these home and share them with their families. 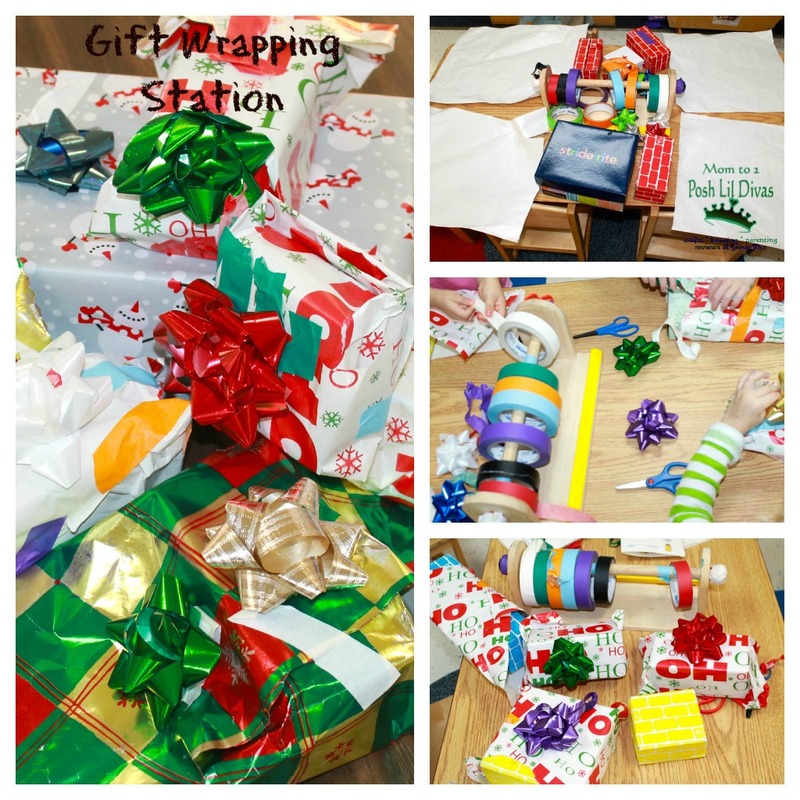 I turned our dramatic play area into an "Elves Workshop" and added a gift wrapping station. It was such a popular area. The children really enjoyed wrapping gift boxes, cardboard blocks and even some toys from around the room. They got really good at it, too. 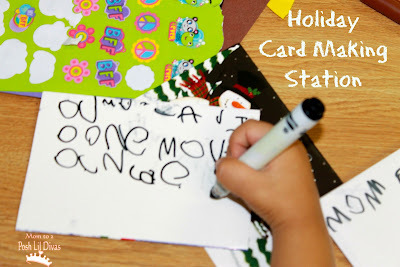 There was lots of fine motor practice going on here as well as fun. All that cutting, tearing, folding, grasping and sticking was working those hand muscles - very important pre-writing practice for those developing hands. Our writing table doubled as our card making station this month. Using some dollar store Christmas cards, envelopes, markers, crayons and stickers the children happily made cards for various family members and friends. The parents were touched by how many people the children thought of and made cards for - both near and far. There was lots more but we were so busy making "secret" gifts for the children's parents and preparing for our holiday party and a mini show with a retelling of the nativity and a few Christmas carols that I missed lots of great opportunities for photos. Preschool is a very fast paced place. I just have to thank you for totally saving my afternoon. Our 4 yr old finished preschool last week but his behaviour was suggesting he was missing the stimulation. I happened upon this on Pinterest two minutes before meltdown (his - mainly....! 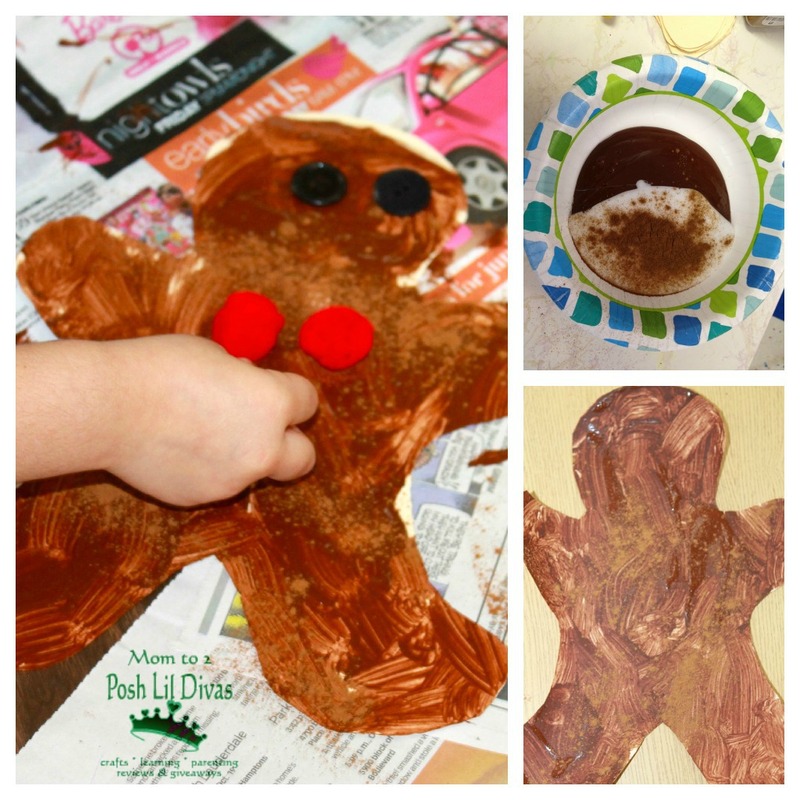 ), used two of your ideas (the number trees and scented gingerbread men) and we all had two happy hours making crafts and learning at the same time. Such do-able yet original ideas! We are doing the wrapping station tomorrow for sure! Thank you so so much! Sarah I am so happy that the ideas were able to help you have some fun and learning with your son. Your comment truly made my day and I hope you have lots of fun with the wrapping station - my preschoolers loved it and happily worked there for days on end whenever they had the chance. Just curious...how much glue do you add to the paint? If using one cup of paint...?